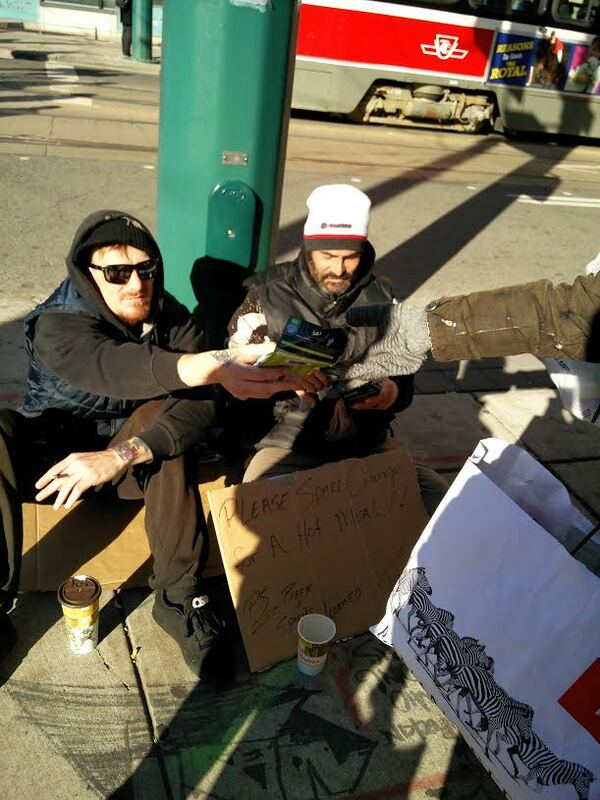 Yesterday, my friend Jasmine and a bunch of us went downtown to hand out socks to the homeless. 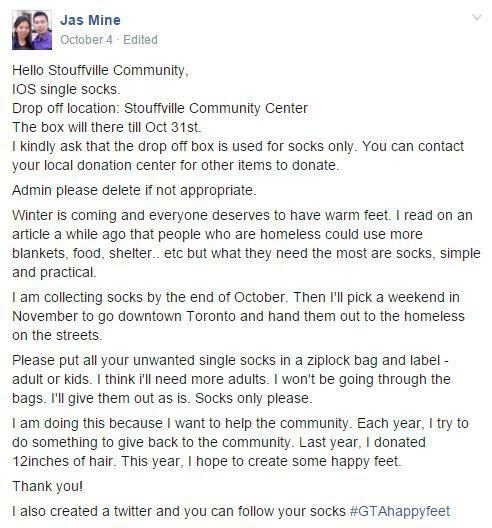 Approximately a month ago, Jasmine wrote a facebook message in her community group asking for sock donations. Within 24 hours, over 100 people responded to the post! People were extremely giving. 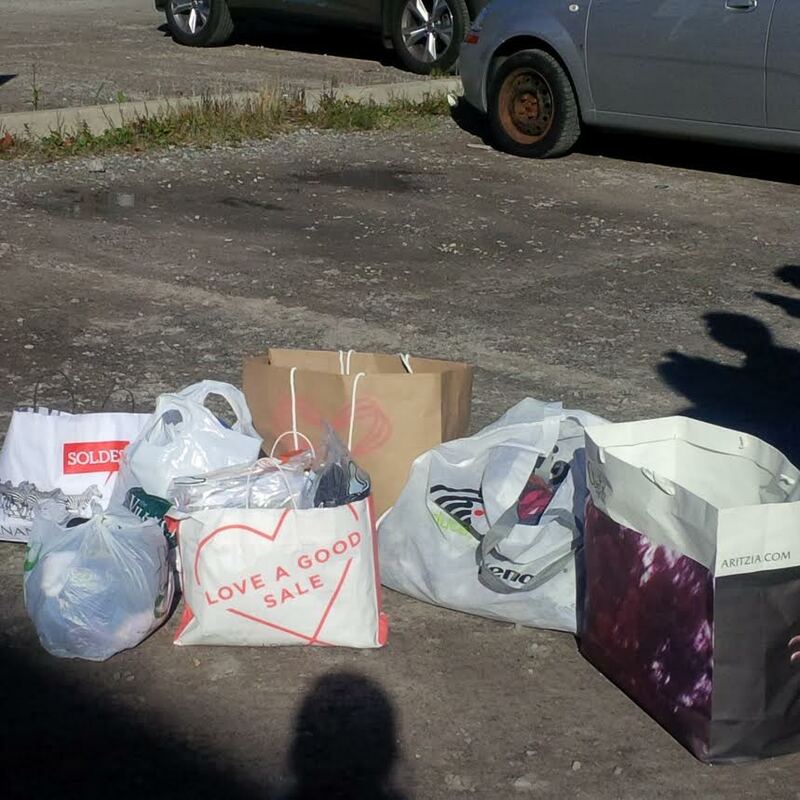 Some wanted to donate toothpastes, gift cards, toothbrushes, money, and so on. But Jasmine decided it was too unfair since only some of the homeless would get the extra stuff. Therefore, she made it clear that only socks were accepted. In addition, SIMS Medical Corp donated a huge box of BRAND NEW medical socks to us. We are extremely thankful. 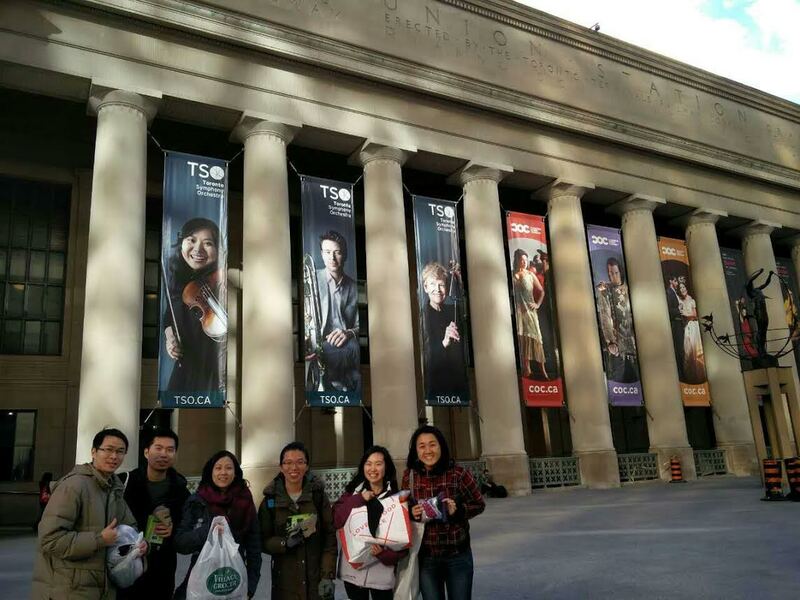 So yesterday, we met at a parking lot in downtown Toronto. Upon our arrival, we were surprised by another kind deed. A previous car owner had paid for full day parking but left early. 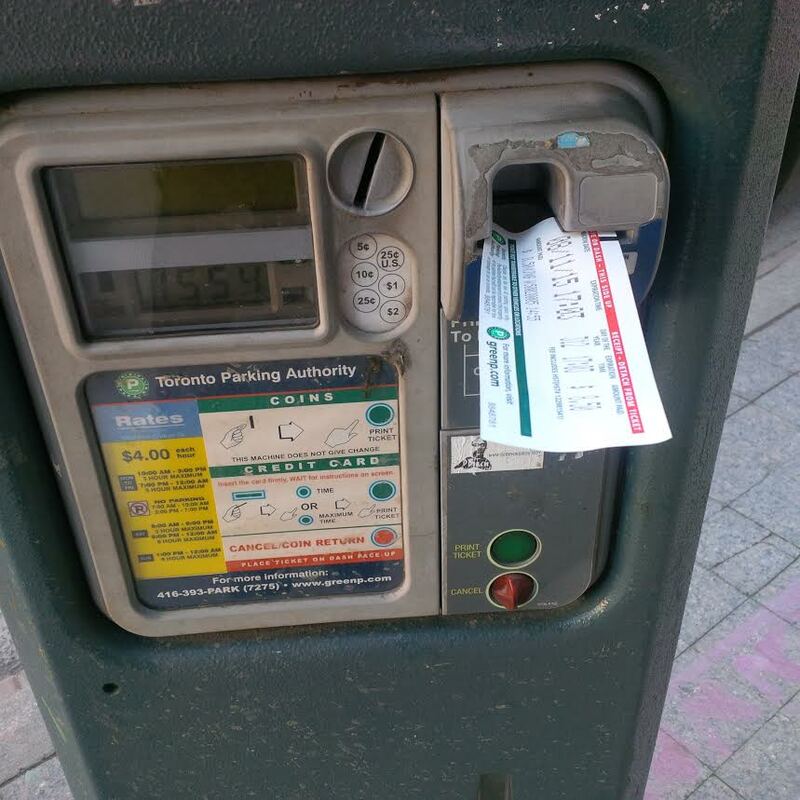 He/she decided to leave his/her ticket for the another person to use. SO KIND!!! 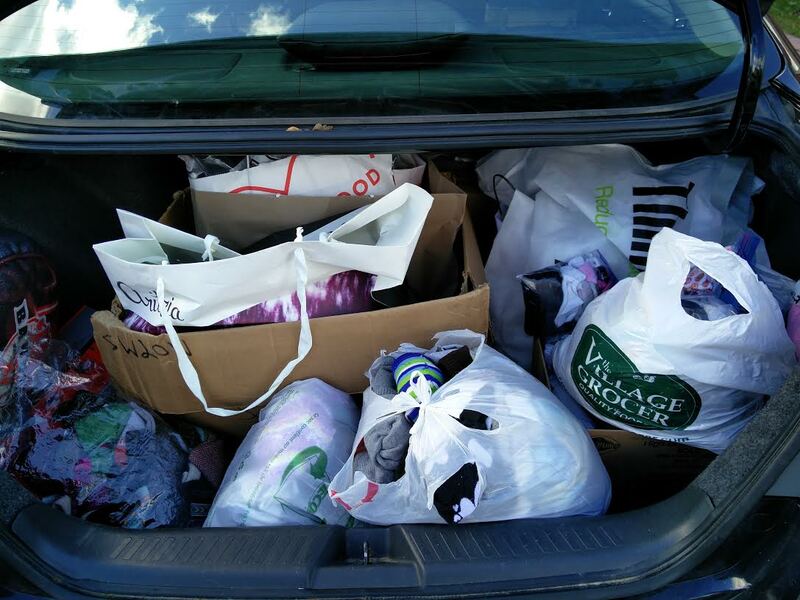 Anyhow, here’s a picture of the amount of socks we had. There were a total of six of us: Jasmine, Orlando, Antonio, Yaris, Jane, and myself. We had the guys there to “protect” us in case anything bad happened. Haha. Anyway, the first homeless people we encountered were extremely polite and well mannered. 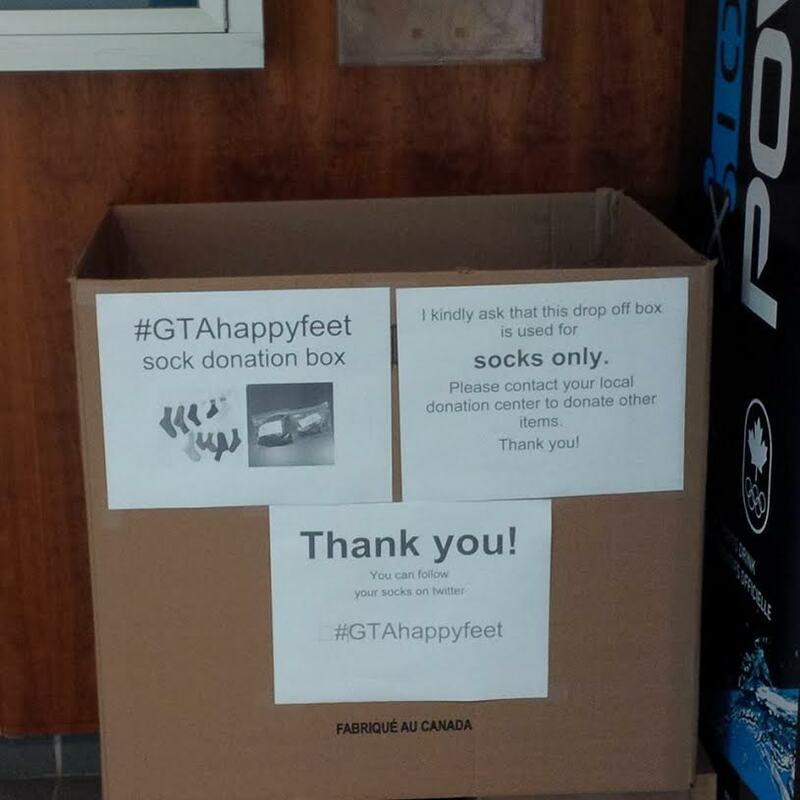 They were very grateful for our socks and responded extremely well towards us. They seemed very normal, and it made me wonder why they were on the streets. We didn’t ask, but I wish the best for them. We wanted him to focus on our socks. Haha. But nonetheless, we carried on. At Union Station, we saw some really sad scenes. There was a person sitting on a remote chair, but his hands were in an awkward position. He clearly could not extend his arms (or extend anything, for that matter). It was really sad. I tried to give him some socks but he couldn’t even hold onto them. In the end, we gave him a bag so it can hang from his chair. Here’s a picture of some of the other homeless around Union Station. If you look closely, you can see that there are many of them sitting around (look across the street). It’s actually very disheartening. Oh, the guy in the blue was feeding the pigeons. That’s why there were so many flocking around him. I was awfully worried that a pigeon would hit or poo on me. Haha, you can see me with my hood on (in the blue pants). (By the way, I was once striked by a pigeon. They are all overweight in Canada. The pigeon was struggling to fly and flapped its wings so hard that it smacked my head. IT WAS SO PAINFUL). Ughhh. Anyway, we carried on and eventually headed Northeast around Queen Street East and Church Street area. It wasn’t a good scene. On one side, we saw a bunch of homeless sitting around (it looked like a garden of some sort -outside of a Church) smoking a bunch of stuff. I couldn’t really tell what they were smoking aside from marijuana, but they were definitely more of the “rowdy” homeless people. Jane and I offered them socks, but some of them were really picky. Ex. Those socks are for women. NO, I don’t want black socks! I want WHITE SOCKS. They did not really look at us, or acknowledged us. But then again, I’m not sure if they were really “there” (if you know what I mean). Orlando, Jasmine and Antonio witnessed a homeless man telling another one to “GET THE F*** OUT” of his territory or he would smash him or something. Across the street, Yaris got yelled at by a homeless woman telling her to, “GET AWAY FROM ME!” Some of them were clearly unstable. We kept heading East, and when we got to Jarvis and Queen, there was a shelter. We were hesitant to go inside because we did not contact the shelter ahead of time to let them know that a group of people would be coming (in case we need permission to give out items on their premises). So all of us were just standing outside, waiting for some of them to come out. At that moment, a lady ran out and we were scared. She did not have any shoes on, and she had spots everywhere. Her hair was a mess and she had a cigarette in her hand. I don’t know what she has but she looked like she has some type of disease. I quickly handed her a bag of socks, but at the same time, I was quite worried she would touch me or something. She wanted shoes, but we didn’t have any. We backed off and quickly left the area. 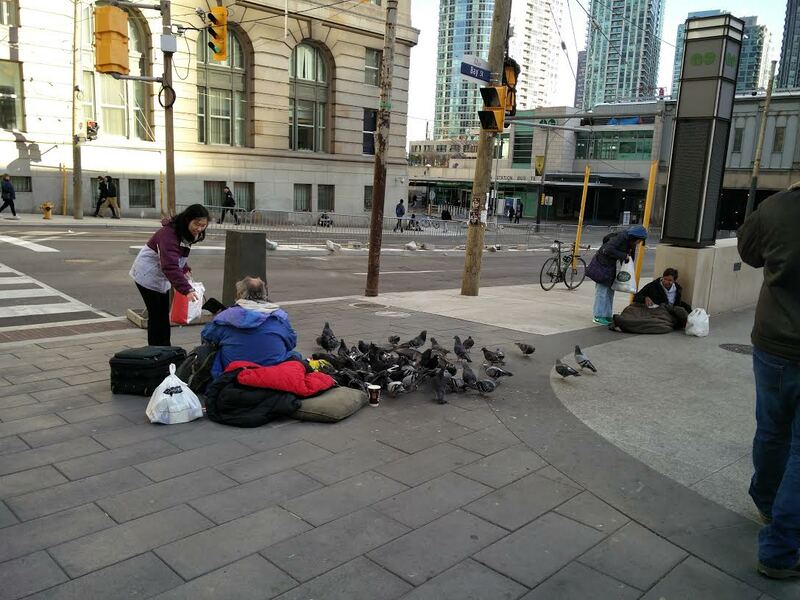 Along our way, we saw another homeless lady outside at the corner of Victoria and Queen. I offered her three pairs of new socks and she was delighted. It was touching because she immediately took off her worn out socks and wore the new ones we gave her. Shortly after, the group decided to head back to the car and Jane and I had to leave. (Jane and I arrived separately our own via streetcar). Thus, that was the end of our adventure. I am glad that Jasmine came up with this idea to help the homeless. It was a nice thing to do and it made me feel like I was doing something meaningful. Honestly, I usually do not stop to talk to the homeless people. They are everywhere downtown, and most of the time, they want money. Once in awhile, I do offer to give them some food or drinks. It’s very rare though. There are just too many, and I cannot help everyone. But from this experience, I really got to look at them. When I asked them questions, I treated them with more respect as I would actually addressed them as “Sir” or “Miss”. When I asked them questions, I would look into their eyes. It is sad. Some of them have been through a lot. I can see it in their faces. Some of them are clearly unwell or unstable. Some of them look like they have no purpose to live. But honestly, looking at them, who would hire them? Aside from the first two homeless individuals we saw, none of them looked like they are able to function normally. Thanks, Karen! It took me so long to write this out. Did you take the pictures too, Grace? They look so good!! 🙂 Yes, I bet your feet must be hurting a lot!! How can you write so much everyday, Karen? U amaze me. Haha. And I’m still translating Chapter 4 (for the internet novel). Blog too long so I’ve stopped half way. Yeah, I totally know what you mean. I agree with you. I want to do more for them too. Very heartwarming gesture. You guys did great. The free parking ticket was certainly a surprise. And you’ll get the hang of Spanish eventually. Haha. Yeah! lol I have never taken Spanish nor been exposed to it. I will have to really do something to learn if I want to pick it up. Haha. Do you know Spanish as well? Thank you for reading & your kind comment. ❤ It was a good experience. That’s amazing, good job you guys. im inspired to try something like this and I will 🙂 that pigeon though, I lived in an apartment in the capital while taking classes and it’s full of pigeons too. One laid an egg above the kitchen cabinet and when I opened the cabinet door, the egg fell on me. Momma pigeon looked at me like wtf you broke my egg. I digress, we need more people like you guys in the world! ^^ hooray for free socks! Thank you!! It was a good deed!! Hehe, I am glad we inspired you! Na the pigeon didn’t poop on me but a crow pooped into my coffee while I was drinking. These stupid birds!